Open Floor Encounter (originally called Open Floor) created by Andrea Juhan, is an exhilarating group process that has evolved out of Gestalt Awareness Practice, psychodrama, somatic psychotherapy, Authentic Movement. For its first 15 years, Open Floor Encounter was simply known as Open Floor taught with the 5Rhythms® being its supporting movement practice. Two years ago Open Floor was renamed and this unique process is now supported by Open Floor International School. Open Floor Encounter is a modern re-visioning of the 60’s Encounter groups. It combines the edgy, pioneer spirit from those years with the sophistication and finesse of more recent psychotherapeutic insights. The carefully structured process is embedded in grounded movement practice, which supports students to connect with and express powerful feelings that emerge in the process. The dictionary definition of encounter is: to come upon, contend with or meet, especially unexpectedly. Open Floor Encounter values, supports, and activates inner meeting with one’s self and mindful interaction between group members. Group honesty is facilitated in a way that supports maturity and radical self-responsibility. What is so exciting is that Encounter teaches us how to meet the unknown and unexpected. At the same time we see our habitual and protective defenses and stay embodied throughout the whole process. In both the group process and the movement practice, the alignment with Spirit and transpersonal states is an essential balance for the intensive meeting students have with their personal process. One is not more important than the other, and therefore both aspects of ourselves are enriched and become balanced. Open Floor Encounter is a carefully structured and implemented mindful ritual and a powerful compassion practice. Movers investigate underlying personal and interpersonal issues that arise spontaneously in the group. This process fosters a supportive and challenging environment. It creates a ‘safe emergency’ – a situation intense enough to get our attention and supportive enough that we risk moving beyond our habitual patterns. It is an active constantly shifting format of group interaction. All participants are recognized and involved as an important part in the unfolding wholeness of the process. Regardless of how one is feeling there is a place to be with that, in an embodied way. Naming and owning ones present state moment by moment, allows participants to see how what they feel is connected to and impacts others. This provides essential feedback, often challenging long held beliefs and assumptions participants have about their self and others. Current research in neuroscience is proposing that repetitive new experiences are actually rewiring our brains. This helps to explain why Open Floor Encounter sessions have such lasting impact on participants. The form begins with a group of witnesses sitting together. One person at a time chooses to come onto the open floor and moves with whatever is calling their attention in the moment. Other dancers will be invited to come up to support this mover by mirroring exactly his/her moves and words. 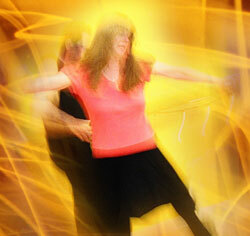 Participants will explore a sense of an ever-unfolding individual and collective Self. This work strongly facilitates all participants becoming aware of their own character structures (ego), habitual roles, and patterns of protection. Artfully graceful, unpredictable and infinitely creative, Encounter calls forth both our compassion and our innate wisdom. We witness ourselves as we are mirrored by others, embracing and embodying our own shapes and movements with the support of the group. This ability to witness each other, as well as oneself, is an essential part of Encounter. Witnessing, as well as the chance to be seen and heard by others, supports each participant’s capacity to change, become more fluid and has a profound impact on the individual, as well as the group. Collectively and individually, we allow each and every part that emerges from us to move through our bodies in the resourcing and integrating practice of dance. Open Floor Encounter opens us to a profound opportunity to know ourselves and be known, to learn to stand in intensity and make clear choices. These are key aspects of mature development both psychologically and spiritually. Artfully graceful, unpredictable and infinitely creative, Encounter calls forth both our compassion and innate wisdom. Encounter Fundamentals: an introduction workshop. This can be a week long, a weekend or a series of one-day workshops. Unfolding Encounters: a series of workshops, over time, with the same group members. On-going Encounter groups: groups are designed to focus more deeply on the interactions the group members have with each other over time. These groups are called Undercurrents and meet for 5 modules, for 4-6 days, over 2.5 years.